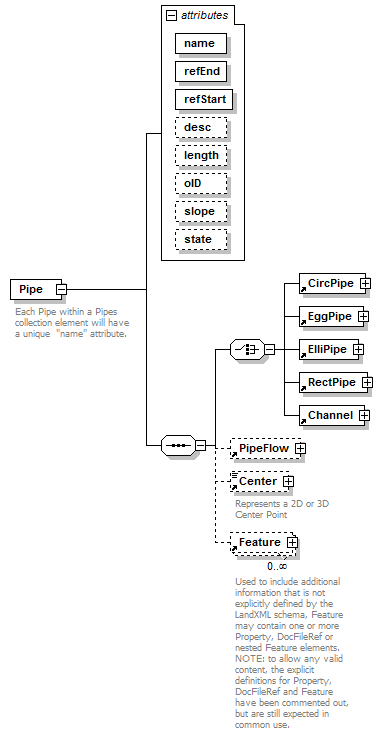 Each Pipe within a Pipes collection element will have a unique "name" attribute. The pipe type is determined by the existance of one of the following elements: CircPipe, ElliPipe or RectPipe. The "startRef and "endRef" attributes reference Struct "name" values. The start and end invert elevations for the pipe are defined in the Invert elements of referenced structures. Since a struct may have more than one Invert element, the Invert "pipeRef" attribute is used to select the correct invert element.